Intuit is announcing major news this evening around its mobile credit card swiping device and Square-competitor GoPayment reader. Intuit is one of the first major U.S. mobile payments readers to go international, with a launch in Canada. And Intuit is debuting a newly, redesigned sleek version of its reader. Launched two years ago, GoPayment offers a complimentary app and credit card reader to allow small businesses to conduct charges via their smartphones. GoPayment is available for iOS, Android and Blackberry phones and similar to Square’s device, the card reader simply plugs into the audio jack of a phone or tablet. The credit card data is also encrypted, (and never stored on the phone). The GoPayment mobile payment app is free and the basic service has no monthly, transaction or cancellation fees, and offers a 2.7 percent rate for swiped transactions. Intuit and Square actually both eliminated the per transaction fee. And Intuit recently started allowing merchants to keep and receive funds on a prepaid credit card as opposed to depositing the amount in a bank account. GoPayment hardware reader and payments apps can now be used by Canadian small businesses and entrepreneurs as a way to accept credit card payments on an iPhone, iPad or iPod touch device. Intuit says that GoPayment for Canada and the new GoPayment card reader will both be available in early 2012. 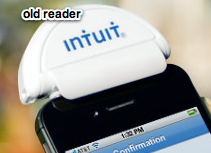 The most physically noticeable aspects of Intuit’s newly designed reader is its color and shape. The reader is now black (compared to its older white sibling, pictured in this post), and cylinder-shaped, creating a sleeker, smaller look. The reader has been designed to feature a silicone sleeve that conforms to the phone or tablet to provide stability support to keep the reader from moving or spinning when swiping a card. Intuit says that without the stability, the readers spin on the audio jack, causing misreads of the credit card and requiring the user to need to hold the product in place while swiping. Intuit has also improved the swipe channel of the device to read cards accurately the first time by putting it on an angle, beveling it and making it longer. For Intuit, being the first to market in Canada is a big win for the mobile payments device. Navigating international markets is tricky for mobile payments companies because each country has different cards and payments infrastructure. We know Square also has ambitions of international expansion in 2012. As for the native competitors in Canada, Kudos is a mobile card reader that is currently available in the country. VerFone’s PayWare mobile reader has also been available in Canada for some time. But considering the massive growth both Intuit and Square have seen among small businesses, the readers should see traction outside of the U.S.